Solar power is now becoming a bigger part of the energy landscape of many countries and it’s really nice to see a lot of scientists working on improving the technology associated with it. The demand for energy is ever increasing and engineers are working hard to keep up with the demand. As we have seen before there have been many efforts to make use of renewable energy more and more. 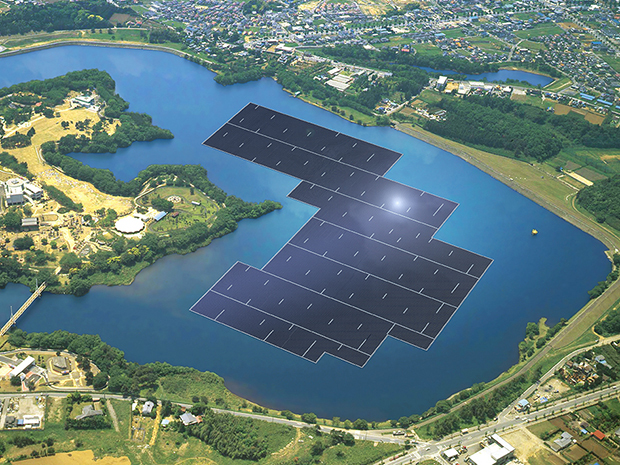 Good news for Japanese people as electronics giant Kyocera is hoping to make what it says will be the largest floating solar power plant in the world. The company is starting construction and the solar plant will be largest in terms of the overall capacity it will have. This is not the first time the company is vowing to make a floating plant but they promise to make this one the most impressive one to date. The whole plant will be built on the Yamakura Dam reservoir located in the south east region of Tokyo Japan. It will give approximately 13.7 megawatts of power when it will be completed in March 2018. The area covered by the plant will be around 180,000 square meters, which is around 18 football pitches altogether to put things into better perspective. The plant will have around 51,000 photovoltaic panels attached together and will produce enough power to give to about 5,000 households in the area. This will save around 7,411 tonnes of CO2 emissions each year, which fulfills the main motive behind going green. Floating plants “utilise Japan’s abundant water surfaces of reservoirs for agricultural and flood-control purposes”, says Kyocera. As John Boyd at IEEE Spectrum reports, Kyocera is working with solar tech experts ‘Ciel et Terre’ on the project. The solar experts have been making these types of floating solar panels since 2006. The whole platform will be supported by modules that are made from metal free, high density polyethylene material that will both be recyclable and won’t corrode easily; adding to this it will also be resistant to the Sun’s UV rays. Ciel et Terre claims that the plant they will make in collaboration with Kyocera won’t affect the water quality in any way. Only evaporation levels will be reduced. The plant will be anchored into the bottom of the Yamakura Dam reservoir. We hope these types of solar plants are increased in number around the world and we make the world a better and greener place soon enough.